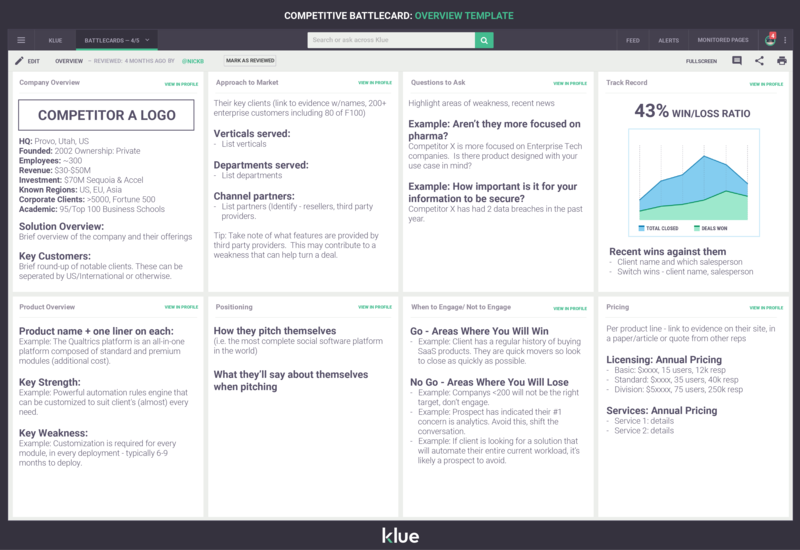 Competitive sales battlecards are the most important tool in your B2B sales enablement kit. Successful organizations use them to win deals, increase business and keep customers happy when competitors get too close. There is increased pressure on sales and retention channels due to new, disruptive players, elevated customer expectations, new tech and unpredictable economic conditions. Your sales strategy needs to be strong, your sales reps need to be prepared and you must have the tools in place to support it. Sales battlecards arm your sales teams with detailed intelligence designed to sell to a specific customer, with unique needs who is considering known competitors. (If they’re unknown, you have bigger problems than closing a deal.) Consider, too, the frequency of contact between your customers and other team members, such as customer success and call centre agents. How prepared are they to manage your valuable relationships? What tools do they have access to that can be used quickly to understand and connect with your customers? Winning sales battlecards dig deep on facts and insight. They are up-to-date and readily available. They position your sales rep as an expert, someone who ‘knows’. A source of knowledge not just about your own product, but also the market and every competitor that the potential customer is familiar with—and some they’re not. The best battlecards deliver only what the sales rep needs to understand the buyer’s needs and what the competitor is offering to meet those needs. What’s the product? How are they pitching it? What are they saying about you? Key bullets and questions help guide and influence the customer through final decision-making process. At that point, you will know what the buyer needs and which competitors are being considered. You will likely have an abundance of data on each of them and you may be tempted to include it all on your battlecards. Do not. It’s all captured in a clear and concise battlecard that can be updated quickly and accessed immediately, from anywhere. Check out our intro post on the basics of building a winning a sales battlecard. So, what exactly gets included in a great battlecard? We asked expert Tim Rhodes to weigh in on the basics. Tim has seen thousands of battlecards and he knows what must absolutely be included to get the win. The aim is to give a base-level of understanding about the marketplace, not a detailed exposition. Include key facts about the marketplace, such as market size, penetration rates and market demand stats. Information about customer segments that should be targeted with the given product or service in question. Go beyond demographics. Include information about needs and behaviours, patterns and insights. Be specific. Stating that a product is ideal for travellers is not enough. Highlight the long battery life, how it automatically syncs to different time zones, and the built-in language converter. Emphasize relationship to other products as well. For example, that the product is compatible with other specific products in the store. This will optimize cross-sell opportunities. Provide specific details about the product in a language that can be understand by the potential customer. This ensures that the same features are highlighted and discussed by sales reps across the company, and across all sales points. Intelligence about competitive offerings around the same product group. Particularly, strengths and weaknesses in comparison to your product should be detailed. Include pricing, warranty differences and anything else to give your rep a competitive advantage during the sales conversation. Based on the target customer segments and competitor analysis, the main proposition for why the product should be accepted by the target customers needs to be developed and provided in this section. Features that set the product aside and possibly relate to branding. For example, unmatchable warranty, best after-sales service and compatibility with other products could all be emphasized here. These come from win-loss analysis and customer feedback. Good, bad or ugly, prepare your reps and strengthen relationships through transparency and trust. Benefits that the product provides the end user should be highlighted here. The more specific the benefit, the more effective the sales pitch (i.e. customers who switch to this tariff usually get a savings of around 30% on their monthly bill). These are questions that can precipitate a sale. They help sales reps to make the best possible product match. These questions are critical in conveying to the customer that the rep is looking out for heir interests. Topics include budget, timeline and intended use of product.